Jennifer Watson began her career as an on-camera meteorologist in Mississippi and Alabama, where she also helped manage both stations’ social media channels and weather blogs. 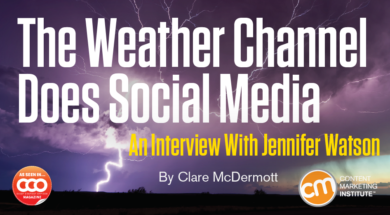 Taking a job as a social media specialist with Atlanta-based The Weather Channel was a natural transition for her. “The Weather Channel is a dream job for a weather nerd like me,” says Watson. CCO: How do you manage the amount and variety of information you curate every day? Watson: At The Weather Channel, our main goal is to provide weather information to help our fans plan their day and stay safe during severe weather. One of the most critical responsibilities of my job is during severe weather outbreaks; we use Twitter to break down storm information to our followers, making sure people have the information they need to keep themselves and their families safe. We have meteorologists on the social media team to ensure that we’re always posting accurate information. In addition to breaking weather information, we also post about a lot of other weather verticals, such as wildfires or drought. Weather impacts every part of your life, whether you realize it or not. It even affects the economy and what you purchase. A lot of our meteorologists are big space geeks, so we also post information about satellite launches, different astronomical events, etc. We are excited and looking forward to this year’s total solar eclipse. CCO: There must be risks related to reporting breaking weather news via social media. Watson: We want to make sure people have a way to get real-time information if they can’t see it on TV. Social media is a great vehicle to disseminate this information but there are definitely challenges. Facebook isn’t ideal for breaking information because information is served up to users based on habits and preferences. Twitter, however, allows us to push out alerts as they are issued and we are able to update forecasts in real time. If we’re following tornadoes in Louisiana or Mississippi, for example, we have automated location-based alerts that go out. My role requires long hours to be sure everything is quality-checked and to ensure that we are getting people the information they need to stay safe. With weather reporting, social media coverage is a 24/7 job; it never ends. I’m always monitoring. I don’t want to miss anything. CCO: What about fast-moving systems in which you’re not sure of the accuracy of the information you see online? What type of guidelines do you follow to ensure that you’re sharing good content? Watson: It’s important for all of us at The Weather Channel to post the most accurate information online and on social channels. To ensure that the correct information is being posted, we have guidelines in place and we always have a meteorologist on duty to review posts before they are published if needed. We have a lot of checks and balances to make sure everything we post is timely and accurate. This is important during and after severe weather outbreaks, when people sometimes post old images of catastrophic damage to get attention. Same with snowfall totals. You might see a picture on Twitter from a snowstorm three years ago. Before we republish anything, we check photos through Google reverse image search to make sure they haven’t been seen anywhere. We are not perfect. If we retweet something that’s inaccurate, we will correct that immediately. When reporting weather, we are always balancing accuracy with speed – because sometimes speed can be lifesaving. CCO: What tools do you use to manage all the content? Watson: We use a combination of native and marketing platforms for our social publishing, analytics, and reporting needs. The combination of the two helps us manage multiple people and projects, especially the increased social volume during live weather events, when conditions and data are constantly changing. Since last year we’ve had a big push to use Facebook Live. One of the ways we pull it off is by using live-streaming software called Wirecast, which lets us combine live footage from the studio as well as the field. We especially like to use Facebook Live in the field, where our on-camera meteorologists can give an update on what the conditions are like in a specific location during weather events. When we are out in the field we have a special rig setup for mobile phones, which gives you a steadier exposure. We also use a shotgun mic if needed, so if one of our meteorologists is out covering a hurricane, we can focus on the sound coming from them rather than the storm. And lighting is critical – it can make a huge difference in the quality of your content and how many viewers you get. All these tools help us share information in a way people can understand, especially when time is of the essence. The live-streaming hardware lets them capture video using multiple webcams, graphics, and more. It also offers better options for screen transitions. The team uses special mobile-phone rigs to pump up the quality of videos outside of the studio. Phone rigs such as the Beastgrip Pro or Shoulderpod let you attach a smartphone, lights, and microphones in one easy-to-grip package. Teaser posts: A great way to drive traction to your Facebook Live streams is to publish a teaser post to let your fans know that you will be live-streaming. You can also use the prescheduling feature on Facebook, which creates a teaser for you. Keep in mind, people tune in at different times, so it’s always good practice to do a reset and welcome new viewers a couple times during each Facebook Live. Live notifications: During the live stream and at the end, remind people they can subscribe to receive notifications each time your page is live, which helps build your audience. Also, remember to alert your fans that if they don’t want to receive live notifications, they can unsubscribe, which prevents people from unfollowing your page. Focus: We publish a variety of content using Facebook Live, but what tends to do best for our brand are live streams and reports from the field during big weather events. We saw our best Facebook Live performance to date during Hurricane Hermine, which impacted Florida and parts of the Southeast in September of 2016. We had a live stream from Cedar Key, Fla., showing the high waves and water only a few hours before landfall. It garnered more than 3 million views, was shared over 42,000 times, and exceeded 23,000 comments. The best advice I can give to any brand is to stay true to your brand values and to keep in mind you may have to test different content out first to determine what works best.